Discussion in 'Traditional Folders and Fixed Blades' started by Itsmebsh, Aug 6, 2018. Just throwing this out there .If anyone has any questions about Olsen OK knives feel free to ask . I will answer to the best of my ability. I have been collecting Olsen's for about 20 + years and have a nice collection of knives plus paperwork and research . If i don't know i will say so . @Duckdog Stuart this is the gentleman that I spoke of. If you wondered where the Olsen folders are. Here! This is a photo of mine. Ashoka, paulhilborn, glennbad and 5 others like this. Ashoka, paulhilborn, glennbad and 2 others like this. Ashoka and WinchesteRalox like this. Love those folders. My only question is where can I find one? While the folders aren't my cup of tea exactly, they look well made. But those fixed blades, those I like. Especially the larger one on the top left. Is this his only style of folder, or are there other patterns? Neat thread would like to see more. Welcome, Itsmebsh, and thank you for any Olsen insight that you can provide. I have a smattering of the history, but it is cobbled from various sources. Those knives are very special. As far as I know there are only two folders. The 511 shown above and a larger version the 510. Hello, Olsen only made two folders themselves. The 511 I have shown and it's bigger brother the 510 in Howard City mi. All of their other folders were contracted out. I will try to take a picture of some 510's tomorrow and share with you guys. one on the top left. Is this his only style of folder, or are there other patterns? Neat thread would like to see more. Ashoka, Fodderwing and joeradza like this. Hello, most of Olsen's folders were made by other companies. Most of the older ones were made in Germany, then Scharade made them for a while. And finally they were made in Japan. Hello, I am pretty well schooled on the history of the Olsen Knife Company. I may not know everything but who does. But I do know the bulk of their story. I have studied about Olsen OK knives with my mentor for over 20 +years. We have collected paperwork and research including interviews for a long time. Unfortunately I lost him to a illness 4 years ago. The stag handle knife on the lower right is the only one that I have ever seen and known to exist. It was given to and executive from colt by Olsen. But there has to be another one somewhere. 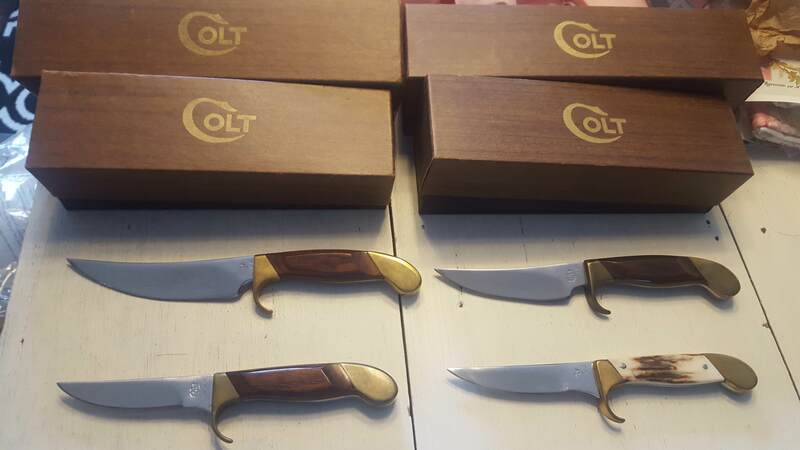 Olsen always made two of every knife. They would build you a knife to your liking if you asked them , but they always made a mate to it just in case someone else liked it. I'm sorry for the loss of your mentor, as those are enriching relationships. I am happy to have your knowledge available here, as I inherited a couple of 511's from my stepfather and started an internet search on the knives' legacy. Interesting, but many short dead-ends. Other than the 510 and 511, what other folders did Olsen make? Or contract from others? I thought the Olsen OK always meant Howard City manufacture. I have a stockman so marked.